Part Three is called A Bird of Wide Experience and is essentially a 12-page sentence. What is extraordinary about it is that I didn't notice that it was a single sentence until about three quarters of the way through it. I had quickly noticed that it was a single paragraph, but I caught myself thinking, "this is a long sentence, I wonder where it started?" As I flipped back through the pages I realized that the sentence had started at the beginning of the section and had barreled on through to the end. 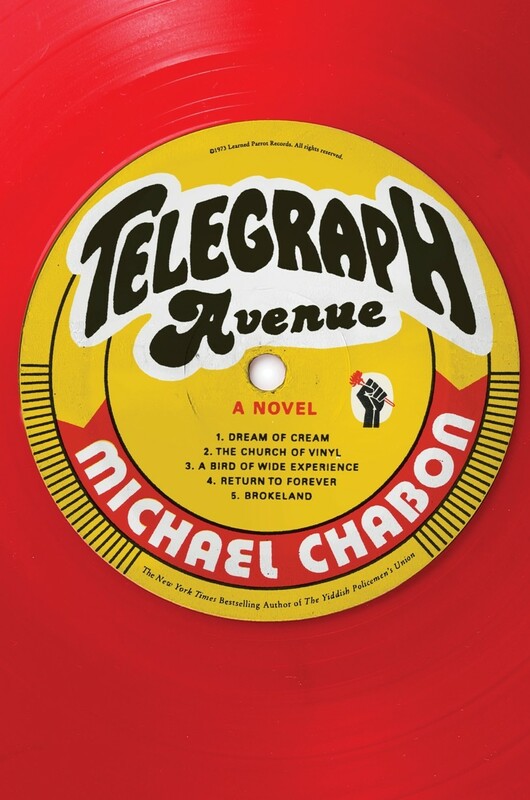 Using a device like this is tricky and is easily botched, but Chabon does it in such a smooth way with the semicolons and commas and the beautiful and compelling language... it just works. Part Four, A Return to Forever, gives us two places where people go when they need to find a sort of home base. On one side we have Brokeland Records, which seems to operate as a sort of spiritual center for Telegraph Avenue. When you need to have a funeral for a man that, in some ways, represents a part of the soul of the area, the innovative, swinging, surprisingly deep soul, you gotta have it at The Church of Vinyl. The funeral brings everybody together, from the Marxist to the mortician, to pay their respects for a part of their community that has passed away. Not just a person, but a representation of what used to be. The other place is the Bruce Lee Institute of Martial Arts, run by the ancient Irene Jew (here’s another name that doesn’t fit the character – I feel like Chabon is just messing with me now). In A Bird of Wide Experience we see Luther Stallings and Valetta Moore sneaking out of the Institute, where it seems like they've been holed up for a while. The Bruce Lee Institute is where Luther Stallings found his martial arts center, it's where he grew into the part of himself that he's the most proud of, it's where he became THE Luther Stallings. The Bruce Lee Institute, "whose secret room, at the back of the stairs leading up to the roof, where exiles and religious fugitives and, for nine nights, a Living Buddha from the mountains of Sichuan, had all known bitterness and safety." It’s a mythic and mystical place of safety and peace. When Gwen leaves Archy, she comes to rest at the Institute as well. Gwen goes there to simplify, find her center (and a place to sleep). When Irene Jew comes to her one morning with a teacup, it's filled with the most simple of all drinks - hot tap water. The drink soothes and warms Gwen. And let's not forget that Archy "[s]lept in some kind of kung fu getup, satiny red with bruce lee institute stitched in white silk across the back." All religions borrow and have things in common with each other. Of course Archy, who worships at the Church of Vinyl, dips a pinkie into the ancient religion of martial arts in his own way. There's something about Luther Stallings that feels evil. I don't know what else to say about it, but the scene where Julie and Titus meet Luther and Valetta in the auto body shop felt like the boys had walked into a seductive lion's den. Titus is enthralled by Luther, while Julie is much more cautious. Kind of a reversal, having Titus fall hard for someone... Luther got Titus all turned around. One more thing that I want to discuss. Titus and Julie. Look, I'm the only male on this read-along and I am here to tell you that young teenage boys very rarely dabble in homosexual activities if they're not homosexuals. I went to boarding school and I lived in a dorm with over 200 other boys and that stuff just didn't happen. Teenage boys joke around A LOT with gay stereotypes, but to actually partake in gay activities is a whole other thing. I might even allow that the bus scene is possible, but the scene in the bathroom at the end of this week's reading, stretches the plausibility of the situation. This is all, of course, assuming that the description of Titus as straight is true. I'm more prone to believe that Titus is bisexual or just plain homosexual. Chabon may be playing with the reader's confusion to mirror Titus' own sexual confusion, but it all just rings false to me. - The scene in which Gwen brings Moby into the meeting with the hospital board was really great. It was funny and exciting and a bit thrilling. - I read Archy's speech at the funeral twice because I liked the rhythm of so much. It's totally different than the rest of the book. - Chan Flowers is coming across as a dark kingpin wannabe. - I'm with Archy when it comes to Luther. Nothing good can come from that situation. - The Aztec suit. Mr. Jones knew how to stay fly. 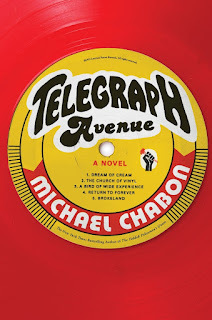 One more week, one more Telegraph Avenue update. Check back next Tuesday for part five, Brokeland!